DOLFINE is the name of my invention. It's a MOTORIZED MONOFIN which imitates the natural movement of the dolphin's fin. It allows to swim and dive feeling like a dolphin. 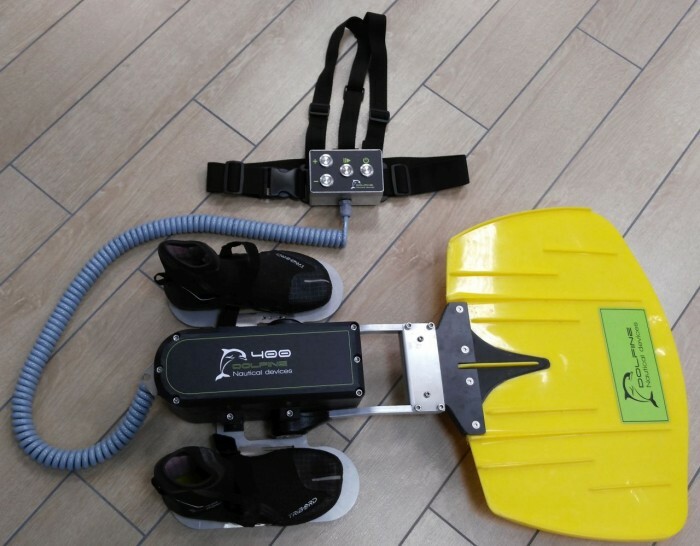 There are other propelling underwater devices, as underwater sea-scooters, but any of them gives the sensations given by DOLFINE. 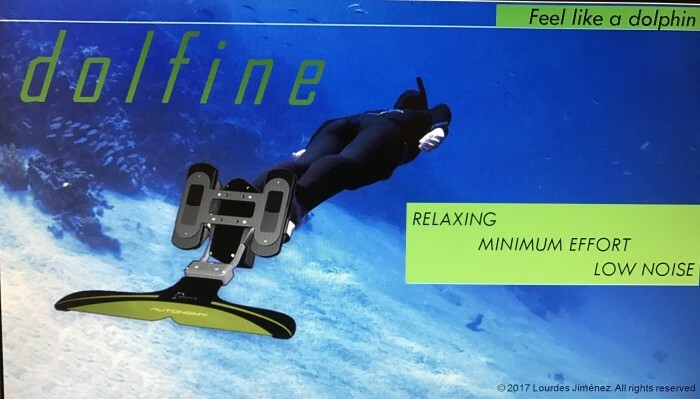 - DOLFINE is very noiseless: it doesn’t scare away the marine fauna. - Much higher performance of monofin vs. propeller (80-90% vs. 40-50%): this means higher autonomy, smaller/chiper batteries and lower charge time. - More aerodynamic due to the fact that is located behind the swimmer, which means no increase of front surface. - Free hands: possibility of carrying by hand other objects as camera, flashlight, etc. - No risk of penetration of objects in the engine. - Cheaper than a high range sea-scooter (the comparison vs. an entry range sea-scooter doesn’t apply). 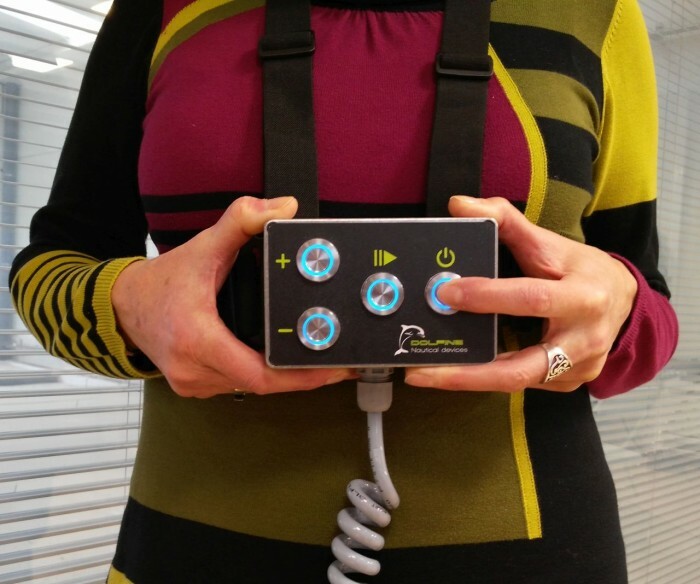 DOLFINE runs with electrical batteries, and the electronic control buttons are in a box which is fixed to the swimmer's chest with a harness. - International PCT patent, not published yet. ISR (international search report) available, with excellent result, which means that the probability of the patent being granted is very high. 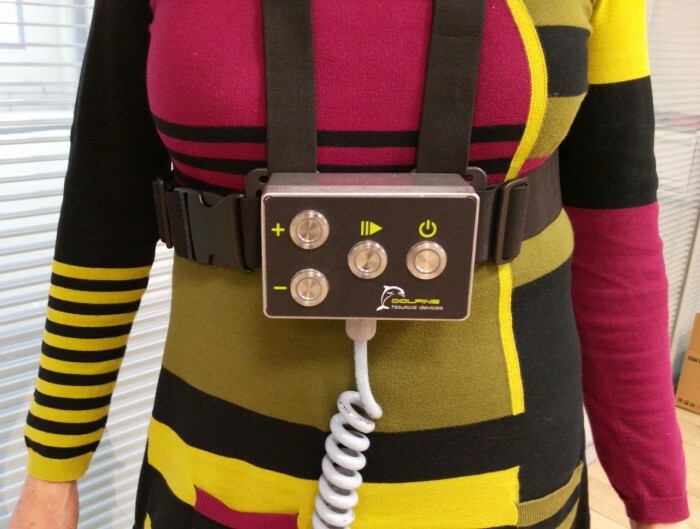 - Functional prototype, which runs very well. - Design: drawings and technical specifications. I am looking for an outright sale of my patent. A license with royalties could be considered as well. The market potential is big (20 million snorkerlers in the world and many thousands amateurs of boats). I have constructed a 5 years business plan which gives a cumulated turnover of 34 million € and a cumulated EBITDA of 14 million €. Page created at 2019-04-25 0:20:47, Patent Auction Time.